Though I’ve long denied it, those who know me well tell me I’m a picky eater. It used to drive Kris crazy. When I started dating Kim, I told her I’d eat almost anything. It didn’t take her long to see that what I meant was I’d eat almost anything other than beer, coffee, mushrooms, and cruciferous vegetables. Over the past year, I’ve made a conscious effort to face some of my food fears, and to overcome them. For instance, last May I started drinking beer, and now I actually enjoy it. (Beer is food, right?) I’ve also discovered the joys of kale and brussels sprouts. But perhaps my favorite new find is coffee. I started drinking coffee in August — tentatively at first — and am now a coffee addict. I think the key to my conversion was starting with the good stuff. I was buying a bag of Stumptown Coffee for my brother’s birthday, and the barista offered me a free cup. I declined at first, but he was insistent. “Do you like tea?” he asked. I do. “Then try this coffee,” he said, serving me a cup brewed from Ethiopian beans. I was surprised to find I actually enjoyed it. Over the next few weeks, I tasted Kim’s coffee whenever she had it. Gradually my coffee aversion faded. In fact, I came to crave the stuff. Now quality coffee is one of my favorite parts of the day. 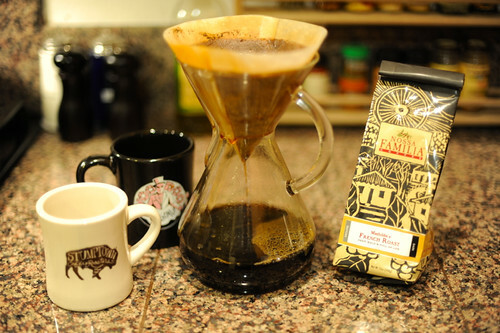 Every morning, I roll out of bed and go to the kitchen, where I pour about two ounces of grounds into my Chemex beaker. I boil a kettle of water, which I then pour over the grounds to produce several cups of awesomeness. The trouble, of course, is that quality coffee is expensive. Some of it is crazy expensive. Stumptown has some great roasts that cost $30 per pound. Yikes. The local organic grocery has some good blends, but they still costs about a buck an ounce. That works out to roughly $2 per day to feed our coffee habit. Note: Because I like to try new coffee, I just signed up for the subscription coffee service from BrewPony, which promises to supply quality Portland coffee on a monthly basis. Sounds like fun to me! Kim is frugal by nature, and she hates how much we spend on coffee. But she also hates the cheap stuff. It’s a dilemma. But she’s come up with a way to tackle the problem: She wants to buy green coffee beans and roast them herself. There’s a place near my condo that offers classes in coffee roasting, and I think we’re going to take one. Who knows? Maybe in a few months, we’ll be enjoying great coffee that we’ve roasted ourselves — and saving money in the process. To be honest, all I care about is that the caffeine continues to flow. Postscript: The next food fear I’ll face? Mushrooms. I hate mushrooms. Kim loves them. To give her a treat (and to give myself the best possible introduction to these vile fungi), we’ll soon have dinner at The Joel Palmer House, a local restaurant that specializes in mushrooms. The wife and I regularly discuss going without for a week to reset our tolerances, but never get around to it. This makes me feel like I should do it more, to prove it doesn’t “own” me or something, but then I think about it and can’t think of a good reason to quit coffee. i just kick the coffee habit this morning. addiction of anything is not a good thing. I don’t like coffee. My husband used to not like it that much too, but for whatever reason he started drinking coffee last year and now he is a coffee addict. We have splurged on espresso and coffee maker last year. He roasts and grinds the beans himself. He now wants to build a coffee machine on his own(!) because nothing gives that perfect cup of coffee. After we move to Portland (you should try his coffee once, apparently it is good), we should also try the monthly subscription service, that sounds interesting. Love the idea of the subscription service! If you find any winners (aside from Stumptown) please share. I have had very few transformatively good cups of coffee, plenty of decent ones, and some really bad ones (Ani DiFranco has a lyric describing coffee as “just water dressed in brown” but we all know it gets worse than that). The stuff I make at home is just okay, and I thought about getting into the gear to make it really awesome, but I’ve held off so far. Probably because my home brew is only okay, I just drink one cup a day, and right now I’m off caffeine altogether for another week. The good news about not really loving the coffee I make is it was easy to kick the habit :-) I bet you’re doing to love roasting your own – I have a friend who got into that, and the results were really very good. Roasting is definitely more economical and (IMO) better quality result as well. Price for good green beans is in the $5-$6 range currently especially if bought in bulk (Sweet maria’s has a good selection and very educational to boot). My recommendation for a roaster is the Behmor 1600 – more expensive than some, but being able to roast a pound at a time is a real plus. You guys should come visit us. MMM makes a killer homemade latte for cheap. We have a cheap espresso machine that seems to work great and we get our beans at Costco. Now mushrooms, I’m not a fan of. I would say the best mushrooms are the simple ones cooked on the grill. They taste much better that way. You should try Coava or Water Coffee in SE PDX. So good! Barista and Public Domain in the SW are also nice options. Welcome to the dark side my friend. Also, I used to be a picky eater and have now reformed due to my boyfriend. As someone who used to eat really poorly (pizza, mac and cheese) now I love salads, mushrooms, kale, beans, avocados, beer, coffee, thai and indian food. I had a discussion with my friend who is still picky– he blames it on his parents. In the US, we have a culture where there is “kids’ food” and “adult food”. Why is that? In so many other cultures, you eat what your parents give you and there is no differentiation between adult and kid food. If you are forced to eat what’s on the table, or not eat at all it might be different. I never though about it that way, but I think the way we deal with food for children, who usually turn out to be picky eaters as adults is all wrong. Why cater to a simple palette rather than explore all the goodness out there from a young age? In regards to mushrooms, try them sauteed with garlic and white wine sauce. It will convert you! Nothing better than good coffee. Although I’ve been on a green tea kick myself lately. I’ve overcome a few food aversion myself lately, namely blue cheese. I just kept trying it a little at at time and now I actually like it. I think there’s something to the 15 tastes theory. For mushrooms- stay away from button mushrooms and try some of the other amazing varieties out there. Especially if it’s a texture issue. I know this is going to sound a little weird but mushrooms are not created equal so don’t try ONE mushroom and base everything on that one mushroom experience. Textures and tastes vary DRAMATICALLY in the little buggers. I love them but then again I really do eat almost everything. I hate exactly the same list of foods. Apparently these vintage corn poppers are coveted by the coffee roasting crowd. I actually have one but have not yet converted it. Beats the cost of a new roaster and apparently it’s amazing!! On the topic of coffee, I lived in Europe in the late 80’s early 90’s. I was appalled at the cost when I first went there but then understood that the quality was worth every cent. Once you’ve had that kind of quality, you can never go back. Now I buy big bags at Costco, grind my own and use a French Press. I can hardly stand any other coffee even in some supposedly good coffee shops. I am now officially a coffee snob, welcome to the club! I rationalize my coffee spending thusly: Coffee is the number one source of antioxidants in the American diet. (http://phys.org/news6067.html) Paying more for an organic, pesticide free form of antioxidants is okay. It’s not like I am buying donuts. It taste good and is vaguely healthy and possibly staves off dementia. The way you guys and gals described coffee addiction made me want to get back on this drug. Nope. I kicked the habit for almost a year already. It is an expensive addiction unless I’m willing to try the local roast that usually includes margarine (Trans Fatty Acid) and sugar – nullifying its antioxidant properties. Now I’m a tea woman who has resolved not to go to all the tea specialty shops to get all those exotic blends that supposed to make you make feel calm and be one with your inner zen. Hmm better watch not to let another addiction brewing …. As for mushrooms, and cruciferous vegetables … these are awesome food!!! Go for it. I love coffee, but I’m not fussy about it. I think that’s from watching all those old cowboy movies like Red River with John Wayne where they used to drink roasted grains and stuff like that on cattle drives as a substitute for coffee, and then go ape when they had the real stuff. I have a Mr Coffee drip unit, and I like to use “French roast,” which can be found anywhere. French roast seems extra strong and intense to me. I only drink it black and I use a lot of grinds. I buy 35 oz for $9.99. It’s delicious. Do you live at my house? I second the recommendation for sweet marias for green coffee beans (try the sampler!) and home roasting videos. I’ve recently started using an electric popcorn popper to roast at home and been really really happy with the result. The stove top popcorn popper was ok but didn’t work out quite as well for me. Your girlfriend seems like a very good influence on you! It’s interesting that it took you so long to like things like beer and coffee and why?! Did you have a bad experience with them? Everyone has food quirks. I’m all for coffee, but have never been even remotely interested in any kind of tea. Not that I hate it; I just find it achingly dull. I was going to urge you to try mushrooms, but then I remembered my own reaction when served eggplant. I second the comments about trying a variety of mushrooms. I’m very fussy when it comes to mushrooms. If they come out of a can or the freezer, run! Oh dear, caffeine is just another toxin that we guzzle on….guess clean living is not for everyone!! Lighten up! You have to enjoy something or life is not worth living. You are frugal in all sorts of ways. Thanks for the Icebreaker all wool shirts tip by the way. You are not careless with your money and you can certainly afford it. I’m sure you don’t waste money on overly processed crap foods, so enjoy. Frugal doesn’t have to mean stingy. Every day starts with some good coffee here at our house! We don’t need the expensive stuff, just something that tastes good to us. We both like the 8 O’clock coffee brand which I buy at BJ’s. It has a nice rich flavor. BJ’s also has several interesting varieties of coffee from different locations (Hawaii, Jamaica, etc.) including some organic ones that I buy when I’d like something a little different. All very affordable as coffee goes. I’m not a die-hard fan of Starbucks, but I stop there occasionally as a treat, and their new Blonde roast is very good! As you get older, that shot of caffeine in your life gives that extra needed boost. I only have one cup a day….a morning tea time pleasure…. Nescafe does me..with a shot of milk and sugar. Ice tea for afternoon tea. Hi Jd just wanted to say, I enjoy reading your blog. like your writing style, I stumbled apon you as you were leaving getrichslowly and enjoyed reading your articles ever sense. Thanks always look forward to the more then money rss feed to light up. I became a caffeine addict 7 years ago when I studied full-time/worked insane hours. Now I drink coffee every single day. I love it. The taste. The buzz. I love to be high-energy all of the time. March is no alcohol month. I’m considering trying a no-caffeine month. Anyone have luck with this? That is something my wife and I are about to try. We are planning to do a little coffee detox in May. I do it simi-regularly but this will be my wife’s first attempt (after being a daily drinker for 5+ years). We’ll report back on the progress. I keep trying to kick the coffee habit in the interest of frugality, but I love it so! My husband bought me a pound of good organic dark roast beans for Valentine’s Day…and I finished them yesterday. He’s not a coffee fan. There’s a pot of Earl Grey on the table, but…meh. As far as mushrooms go, I would encourage you to try a roasted portabello. I think you should have left well enough alone. Why start drinking coffee and beer when both are expensive and addictive. Now you have two monkeys on your back that you didn’t have before. Quit trying to reinvent yourself, we liked the old you . Someone gifted me with a pound of Stumptown beans last year–heaven! Taking a trip to OR in a week and plan to pick up another pound of that heavenly delight. I was thrilled when I read that coffee might stave off dementia. No need to worry about having that second cup anymore. Beer, on the other hand, is something I will never like, and now that I need to be gluten-free, it’s also socially acceptable to forgo even in the land of microbrews. The coffee addiction is the best addiction. I’ve been happily drinking the medium grade stuff for years, but in retirement I’m going to become a coffee aficionado. I need to check out one of those beakers as well! To me, the willingness to eat adventurously is a sign of an open mind and spirit. My 18-year-old son recently surprised me, saying he’d just made a personal vow not to say no to any unfamiliar food offered to him. I have since seen him eat mushrooms, raw oysters, hot sauce, curries, collard greens and various kinds of fish. He also asked my boyfriend to give him a “tutorial” in beer, and he’s even curious about the world of cigars (as a parent, I have mixed feelings about that one, but I see what he’s getting at). The food angle is a great way to explore the diversity of this world! And not much makes me happier than my big round mug of café au lait in the morning, even if it’s made on my stove, in my little one-cup espresso pot, out of (fair trade) coffee from Aldi ($6 per pound)! My favorite breakfast here in Portland is an omelette that’s made with wild mushrooms and chevre. If you don’t like it, tell Kim I’ll go eat mushroom meals with her anytime! J.D., how did I miss this!? I hope you enjoyed your first shipment of BrewPony. The second one will be on it’s way in a week! As for roasting yourself, lots of commenters here have steered you right—Sweet Maria’s is a great source for the home roaster, and their site is full of educational material as well. I slowly came to coffee as well. I hated my dad’s coffee breath as a kid, but in college realized energy drinks probably weren’t the best way to get caffeinated. I started with espresso shots on ice. Chug and chase. When I found high quality coffee everything changed for me. It’s now quite an obsession. As for economy, here’s my 2 cents. Try a quality light roasted $15/bag coffee for your caffeine fix and make it cold brew. Making cold brew results in a low acid, and a decent daily drink. Then bust out the higher end stuff for 1 small cup every day or every other day. That’s when I drink my $30 to $50 a bag coffees. Either way, it’s still way cheaper than wine. You buy one bottle for $15+ and get 3.5 glasses. A 12 ounce bag of coffee gives around 25 cups of coffee. I think the coffee market can go way up in price when more people start seeing the value. Previous post: Ask the Readers: Finding Personal Health Insurance?